Optimism never dies and pessimism is dead even before it is born. Saggis are born optimists and I am one. During trying times, I always remind myself that "Everything will be okay in the end. If it's not okay, it's not the end"
Good post, Chicky. As I suspect most optimists do, I fight the pessimist in my head frequently to allow optimism to rule. Not always easy as the pessimist has so many things to say. 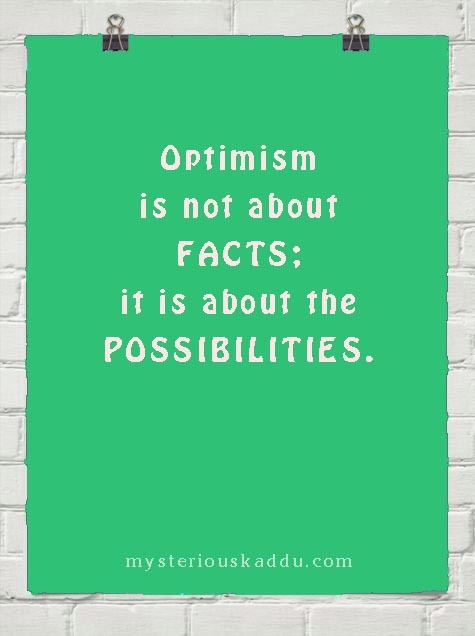 Three cheers to optimism! I don't have a lot of patience with pessimists. Wonder how they survive all that negativity. That's a good approach, Dr. Bushra. I guess we all need a little time for introspection every now and then. To live we need to be optimistic. Otherwise we are just wasting our time worrying and filling our minds with negative thoughts. I try to stay positive all the time. My favorite quire is" where there is a will, there is a way." Gives me strength during difficult times. All the best for AtoZ, Chicky. Optimistic people are positive souls, they are the best people to be around with, specially when you at nervous or worried. There's always an air of happiness around them. Very nicely put together post! I liked how objectively approached all points under optimism and pessimism. Well, by default I'm somewhere in the pessimism zone. But I tend to use it to my advantage. I am, as you said, a self critic, and constantly try to better myself and make the best of the situation. Maybe its semi optimism as well. Technicalities, as they say :) Thanks for sharing! Oh yes, Vinitha. It most certainly is a waste of time! Hahaha! It sure does get too heavy for me too at times, Sreesha! I find it easier to bear with it when I'm too busy with things. 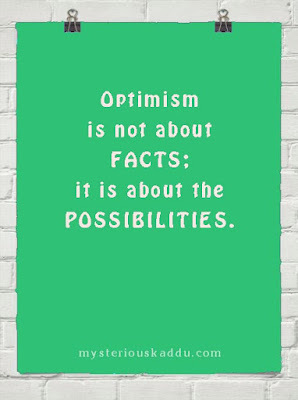 Love the quote optimism is not about facts but possibilities, That summed it up very nicely for me. Sigh...as much as I know the benefits of being optimistic, it's one of the hardest things for me. I'm by nature a cynic and pessimist. Part of my Flourish Inside Out challenge this year was to develop my optimism and positive emotions further but I'll be honest I'm still struggling. Take your time, Sanch. Read Osho maybe. I kind of like his books. Even though he's very repetitive in them. Impressive as usual Kadambary! I am one optimistic person and most often I feel that is what is keeping me going ahead! Hi Menaka. Being optimistic is better in all ways actually. In fact, that really is what keeps us going. Otherwise, we become stuck at one place.